73636 MAX SAAR (1959) Max & Moritz. 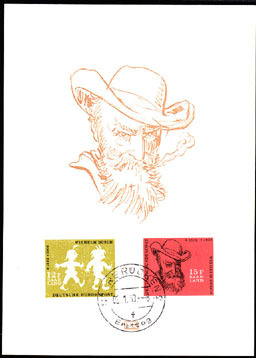 Wilhelm Busch*. Maximum card with First Day cancel. Scott Nos 309-10, Yvert Nos 411-2. 67849 SPE NORTH KOREA (1989) Badger measures the height. Set of 3 specimens. Scott Nos 2838-40, KSC Nos 2900-2. 49092 SPE NORTH KOREA (1989) Cartoon*. Raccoon Dog*. Set of 3 overprinted SPECIMEN. KSC Nos 2900-2. Scott Nos 2838-40. 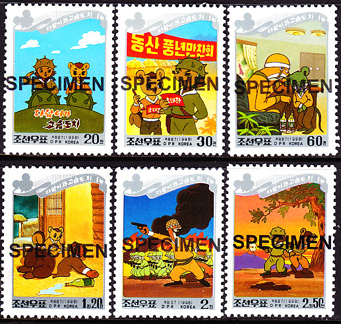 49198 SPE NORTH KOREA (1998) Cartoon of Squirrels & Hedgehogs*. Set of 6 overprinted SPECIMEN. KSC Nos 3868-73. 74438 ND MONGOLIA (1999) Betty Boop. Set of 2 imperforate S/S. Scott Nos 2370-1. 68412 SPE NORTH KOREA (2003) Animated film "Antelopes defeat bald eagles". Set of 5 (4 stamps + S/S) specimens. Scott Nos 4261-5, KSC Nos 4240-4.